We’d love your help. Let us know what’s wrong with this preview of Ghostbusters by Sandy Petersen. 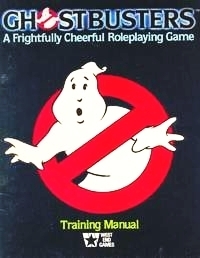 INCLUDES: A Training Manual for players, an Operations Manual for Ghostmasters, 4 handouts (sample business forms, a 3-page basic rules sheet, one franchise document, and a last will and testament), 5 regular dice, The Ghost Die, 48 small equipment cards, and 12 character cards (6 Ghostbusters and 6 blanks). To ask other readers questions about Ghostbusters, please sign up.